This week’s mass shooting targeted Jews. Did you know that about 40% of the Marjory Stoneman Douglas High School population, where a white male student killed his peers this week, is Jewish? Or that five of the 17 dead are Jewish? Think about the strain this puts on the synagogues this week, just in terms of comforting those who mourn. In debates about guns and schools, we often think in abstract terms. Instead, we need to think specifically about these people. Where will all the funeral goers park? Will they be too scared to come, out of a fear of a follow-up shooting? How will the elderly who want to join with the community in grieving get there? What does it mean to miss a funeral because you are in the hospital recovering from your own wounding? How, in this day and age, do you trust your neighbor not to kill you? How do you open up your synagogue to neighbors who would do this to you? 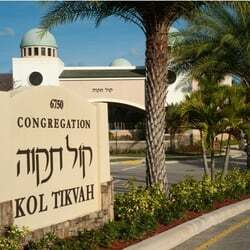 Above, Congregation Kol Tikvah, near the high school in Parkland, Florida, where a student murdered 17 of his peers, has been supporting people all week. How do you open yourself up to that work when you were also a target of this violence? I don’t know. This wasn’t just an attack on the shooters’ peers who he hated or the girls who wouldn’t date him. It was in effect–and given the shooters’ white supremacy, in purpose–also an attack on Jews. White supremacy, misogyny, anti-Semitism, toxic masculinity, guns–this is a familiar story. Please don’t forget it.